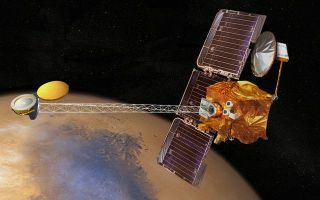 An artist's rendering shows the Mars Odyssey spacecraft. This story was updated at 4:30 p.m. ET. An old NASA spacecraft in orbit around Mars is a step closer to recovering from the malfunction of a small but vital part that keeps it pointed at the Red Planet, NASA officials say. NASA engineers are testing a spare reaction wheel aboard the 11-year-old Mars Odyssey spacecraft in the hope of restoring the aging probe to active duty after more than a week of down time. The move comes after the spacecraft slipped into a protective "safe mode" when another reaction wheel seized up last week. The Mars Odyssey spacecraft uses three spinning reaction wheels to control its orientation in space. But on June 8, one of those reaction wheels jammed temporarily and sent the orbiter into a safe mode to await directions from mission controllers on Earth. The backup reaction wheel is available to replace the malfunctioning one, if needed, mission managers said. "We are taking steps to assess the replacement of the troublesome wheel with the spare that Odyssey has been carrying for exactly this purpose," said Gaylon McSmith, project manager for Mars Odyssey at NASA's Jet Propulsion Laboratory in Pasadena, Calif., in a statement. "If the assessment results are positive, this will put us on a path toward resuming full use of Odyssey." NASA's Mars Odyssey mission is the longest mission to Mars in history, and the spacecraft continues to play a vital role in the orbital and surface study of the planet. In addition to observing Mars, the orbiter serves as a communication relay for NASA's Opportunity rover on the Martian surface and is expected to do the same for the huge Curiosity rover when it lands on Mars on Aug. 5. "A lot of our data gets relayed through Odyssey, so when Odyssey's not available, we don't see our data," said Cornell University researcher Rob Sullivan, a science team member on the Mars Exploration Rover mission, which oversees the rover Opportunity. Sullivan said some data does get routed to Earth directly or via another NASA orbiter, the Mars Reconnaissance Orbiter, but regaining the link through Odyssey would assure the best data delivery. "We are hoping, for all kinds of reasons, that Odyssey has a smooth recovery, and when it does, we'll be very grateful for their continued support of our mission." SPACE.com assistant managing editor Clara Moskowitz contributed to this report. Follow SPACE.com on Twitter @Spacedotcom. We're also on Facebook and Google+.